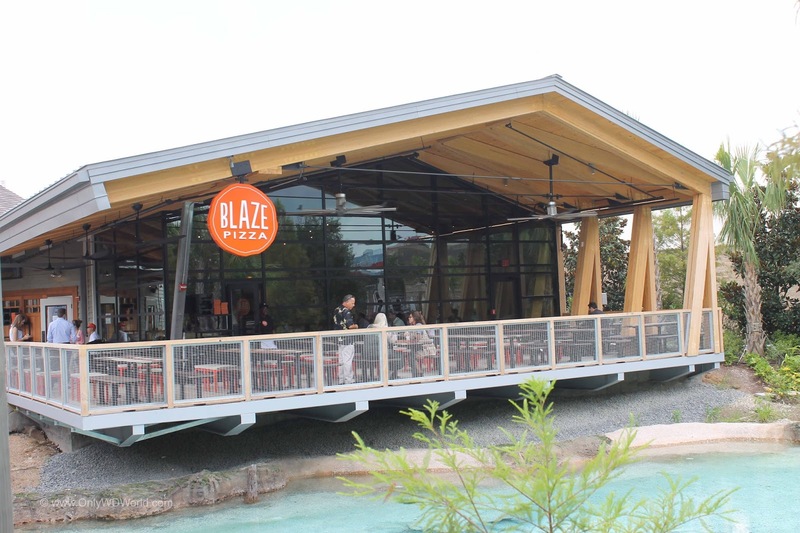 Blaze Pizza is opening their 150th restaurant at Disney Springs. 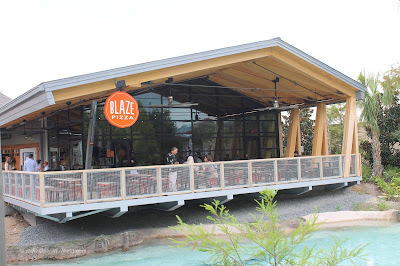 Only WDWorld was there to check it out and to provide a First Look impression of Disney World's newest restaurant. 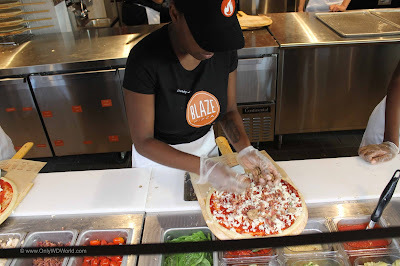 Located in the new Town Center section of Disney Springs, Blaze Pizza is a family friendly, low cost, quick service dining option that features Fast Fire'd (cooked in 180 seconds in an 800 degree oven) pizzas that are completely customizable with your choice of 4 sauces, 8 cheeses, 8 meats, 18 vegetables, and 5 finishes. 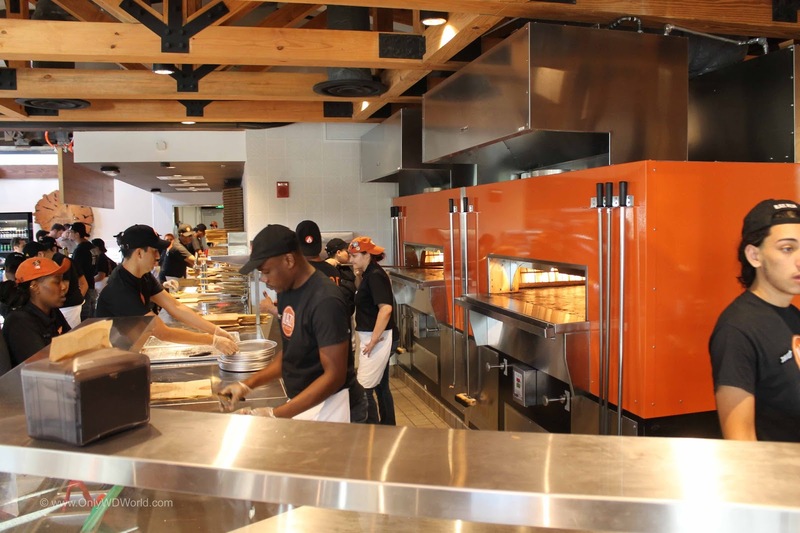 According to Jim Bitticks, Blaze Pizza EVP of Training & Operations, Blaze Pizza provides artisanal pizzas that can please the entire family by providing the flexibility for each person to make the pizza that fits them. 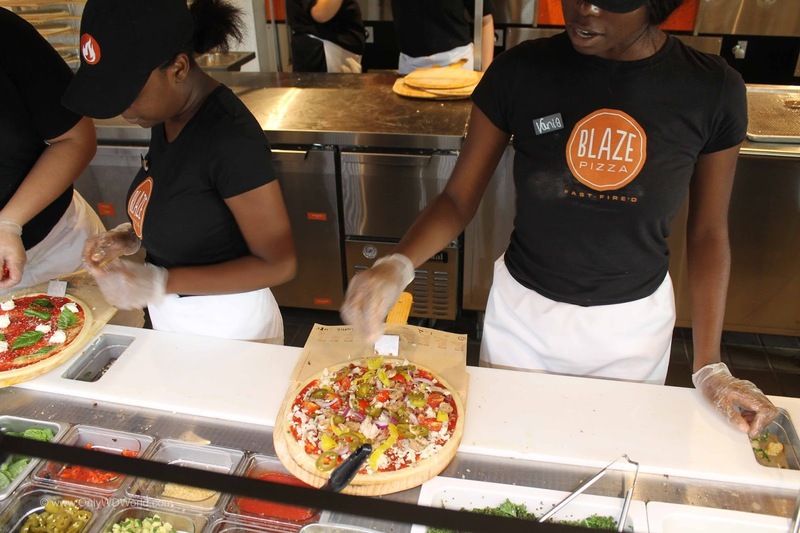 Blaze Pizza is proud of their high quality ingredients, as well as a gluten-free dough option and a vegan friendly soy-cheese option. They even make their own Agua Frescas on-site. 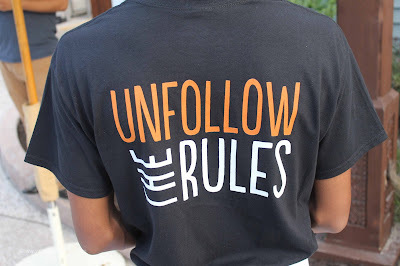 The employees are encouraged to have fun and embrace the "Unfollow The Rules" mantra found on their shirts. It is this spirit that has led to the rapid growth of their chain and is why they aspire to grow from their current 150 to over 1,000 restaurants over the next 10 years. We had the chance to test out the "Blaze Pizza Experience" prior to the official opening on Friday August 5th. The menu is all about the pizzas, there is a wide variety of options, but pizza is the name of the game here. Upon entering the restaurant for your first time it can be a little intimidating. 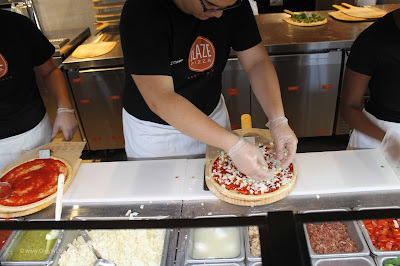 The first choice that you need to make is deciding if you want to order one of the already designed Signature Pizzas (8 choices ranging from Red Vine with Fresh Mozzarella, Basil, and Cherry Tomatoes to the Meat Eater) or build your own pizza. The great feature of Blaze Pizza is that it is the same price for picking a Signature Pizza or Build Your Own. There is no per item topping add-on fee. The staff was very friendly and helpful throughout the process. I opted to build my own to check out the different topping choices and to get the full experience. Step 2 is to pick your Sauce. 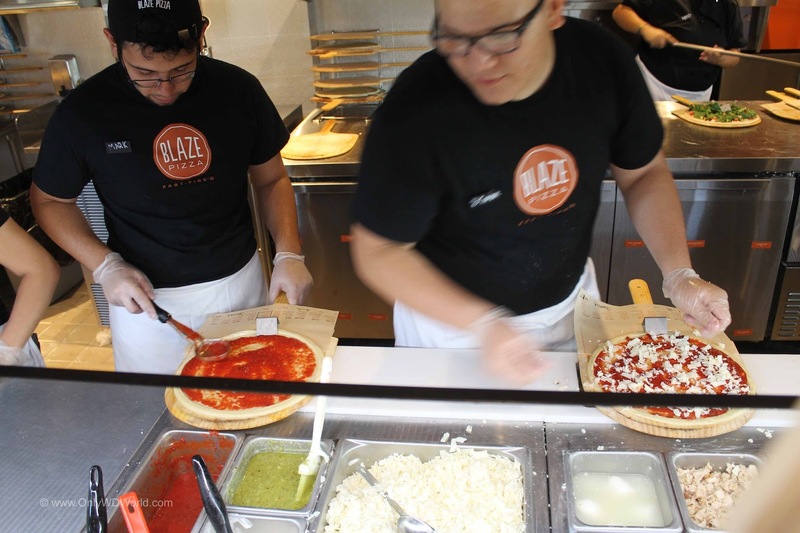 There are 4 choices to pick from: classic red sauce, spicy red sauce, white cream sauce, or garlic pesto sauce. 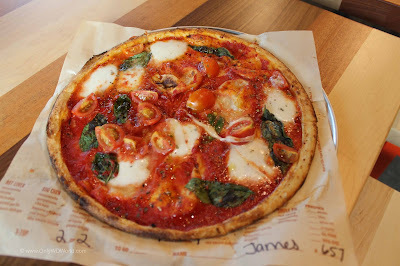 I opted for the spicy red sauce on my pizza with the traditional dough. The next step is picking your cheese or cheeses. You are not limited to picking just one. 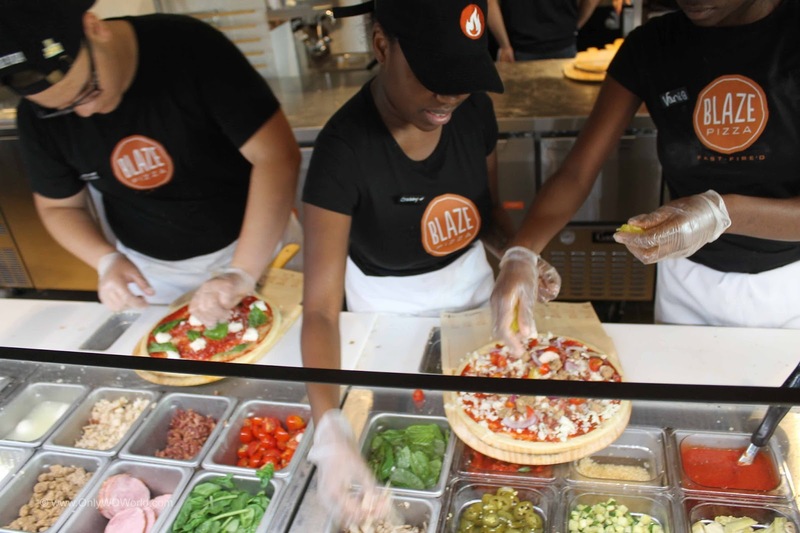 There are 8 to choose from: feta, goat, gorgonzola, ovalini mozzarella, parmesan, ricotta, shredded mozzarella, & vegan cheese. I picked shredded mozzarella and gorgonzola cheese for my pizza. 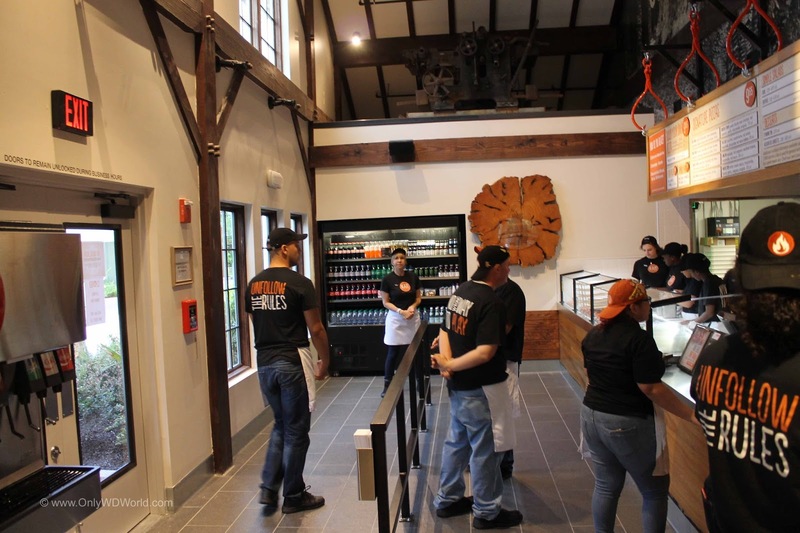 There are a multitude of great meat choices to pick from: applewood bacon, grilled chicken, italian meatballs, italian sausage, pepperoni, salami, smoked ham, and turkey meatballs. My pizza received italian sausage and applewood bacon. Once again no shortage of choices here either: artichokes, banana peppers, black olives, cherry tomatoes, chopped garlic, fresh basil, green bell peppers, jalapenos, kalamata olive, mushrooms, oregano, pineapple, red onions, red peppers, roasted garlic, sauteed onions, spinach, & zucchini. 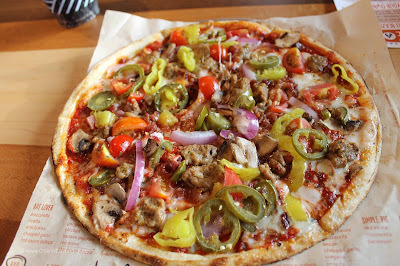 After some deliberation I choose: banana peppers, cherry tomatoes, jalapenos, mushrooms, oregano, & red onions. After your pizza is built they take your name and your pizza heads off to the flaming ovens that range from 600-800 degrees for 180 seconds of cooking. 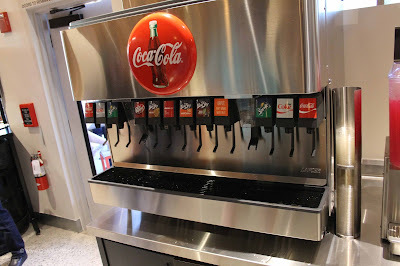 Then you proceed to the cashier to pay and add choice of drinks, salad, and desserts. This is the look of the pizza after coming out of the oven. They call your name and you come pick up your pizza. 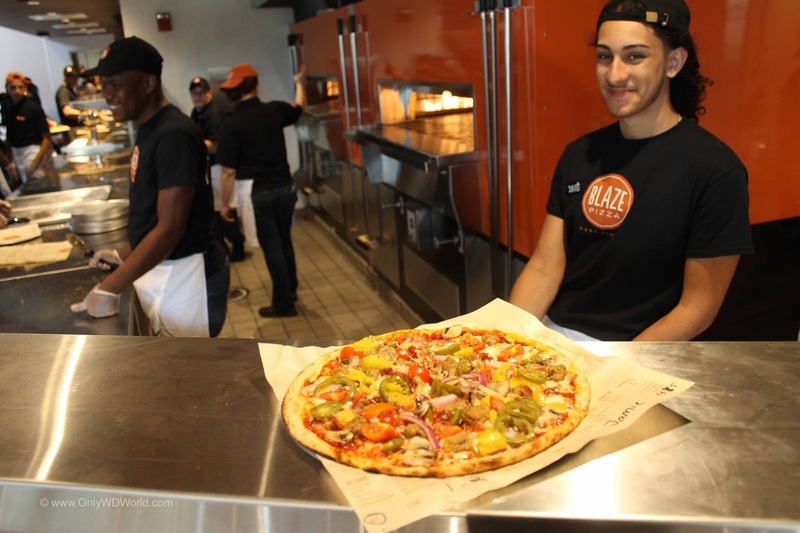 It is about 11" in diameter with a think crust. 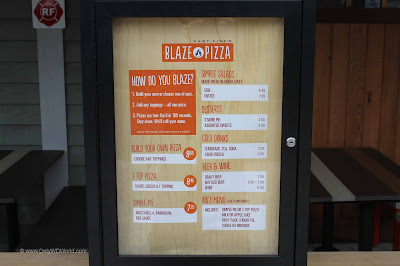 This is the pizza that should be named the Only WDWorld! It held up well, even with all of the toppings and tasted great! At the end of the day, the best mark of a restaurant is how the food tastes, and this pizzas was excellent! The above picture is the Red Vine Signature Pizza. Simple, but tasty. 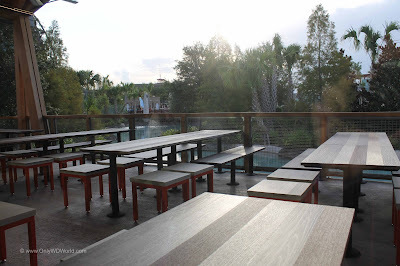 There are choices of seating inside or outside at the Disney Springs location. 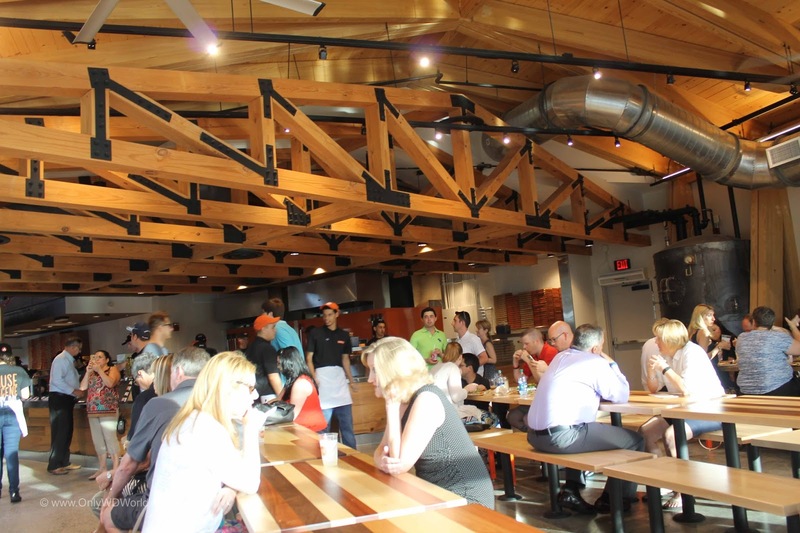 The outside seating is much more scenic, but the inside is air conditioned. It will be noisy inside, so don't worry about bringing the kids. Even with all of the noise it was not difficult to hold a conversation inside. 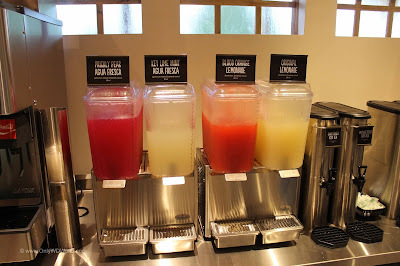 Here is a look at the fresh Agua Frescas and lemonades that are made on the premises. There are also choices of Coke products, bottled beverages, beers, and wines. 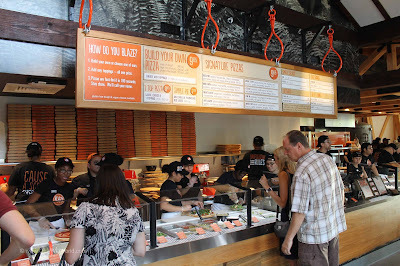 This was our first Blaze Pizza experience and based on the great food and service it will not be our last. The assembly line feel was a bit like fellow Disney Springs restaurant Earl of Sandwich and it will also provide a similar price point for families. This is definitely a quick service option that you should strongly consider. 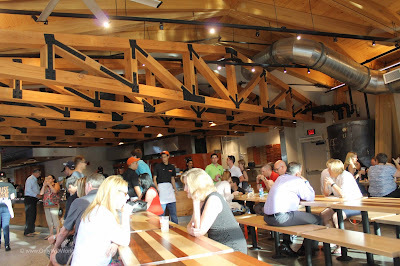 Come for the great pizza and enjoy the reasonable prices, & comfortable, family friendly atmosphere. 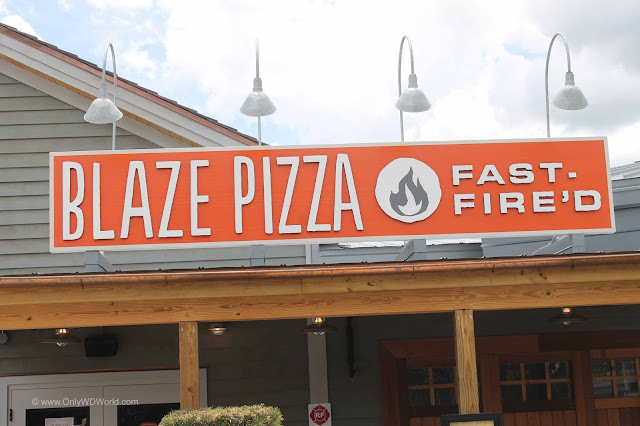 0 comments to "First Look: Blaze Pizza Comes To Disney Springs"